Some diurnal passage of birds heading south in the morning included 363 Pink-footed Geese, 182 Greylag Geese and a few pipits and Skylarks. A Hawfinch in Holland House garden was the bird of the day and the first one of the autumn, while other passerines included a Black Redstart, 2 Common Redstarts, 5 Tree Pipits, 259 Meadow Pipits and 4 North-Western Redpolls. A distant Large Shearwater sp. was seen from the seawatching hide and a Storm Petrel, a Manx Shearwater and 22 Sooty Shearwaters were the other highlights from a slightly better day of sea passage. 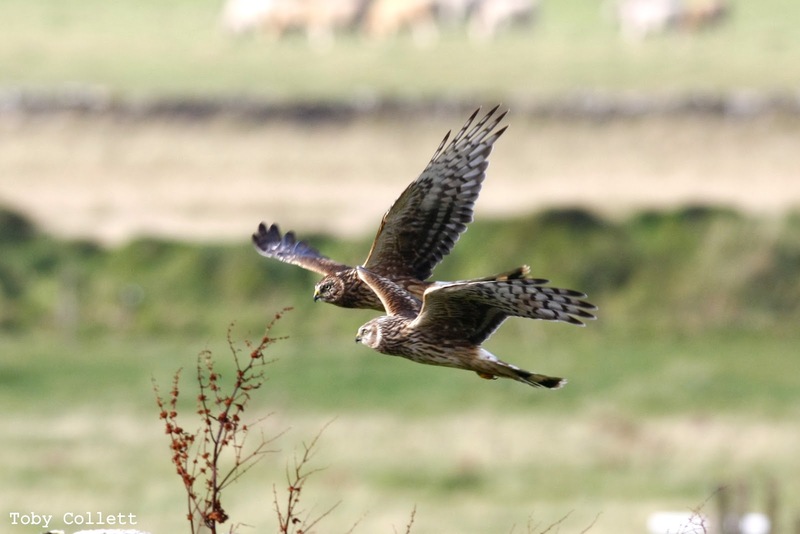 A trio of Hen Harriers were seen again, along with at least 4 Merlins and a Kestrel. A quiet day saw mainly just leftovers from earlier in the week. Small migrants included a Yellow-browed Warbler, 7 Tree Pipits, 2 Redstarts, 2 Whinchats, 2 Spotted Flycatchers and 2 Common Redpolls. While most migrants remained in similar or slightly lower numbers, the highlight of the day was a Buff-breasted Sandpiper seen in flight near Bewan Loch, although it could not be relocated on the ground. A couple of Yellow-browed Warblers were the best of the new passerines, and other noteworthy migrant species included 15 Tree Pipits, 4 Redstarts, 5 Spotted Flycatchers, 26 Bramblings, 121 Song Thrushes and a North-Western Redpoll. An American Golden Plover, 3 Hen Harriers and 2 Woodpigeons were all still present. A couple of Little Buntings seen in the morning were in very different locations to recent birds and were likely to be fresh migrants. A Pectoral Sandpiper was the day's other highlight, adding to an impressive tally of the species this year. Passerine migrants were still scattered around the island in reasonable numbers, including 143 Song Thrushes, a Ring Ouzel, 9 Redwings, 8 Redstarts, 2 Whinchats, 12 Tree Pipits, 3 Spotted Flycatchers, 25 Bramblings and 5 North-Western Redpolls. Snow Buntings reached a new high of 151 and 18 Lapland Buntings were seen. And both American Golden Plovers were still here. 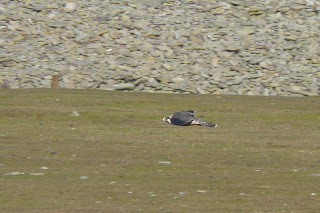 Three Merlins featured among a good line-up of birds of prey that also included 3 Hen Harriers, 2 Peregrines, 2 Kestrels and a Short-eared Owl. 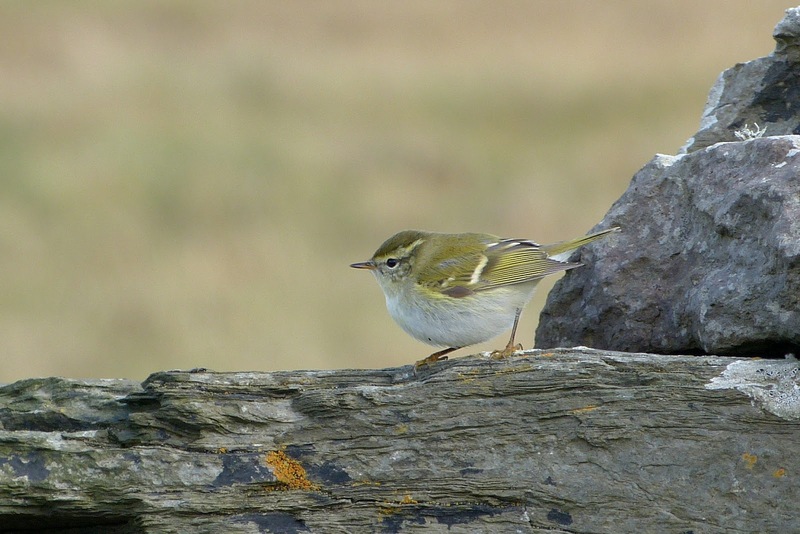 The long hours of relentlessly walking the island's walls and ditches finally paid off late in the afternoon, with North Ronaldsay's third Lanceolated Warbler popping up from the edge of a field near Gretchen Loch. 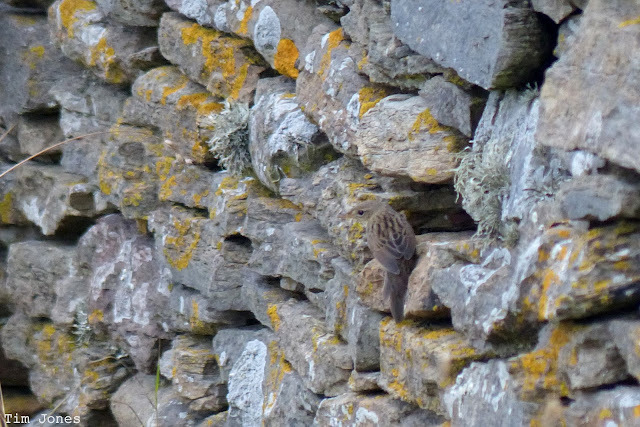 In fading light, it showed well for all observers just before tea, sometimes perching in the stonework for long periods. 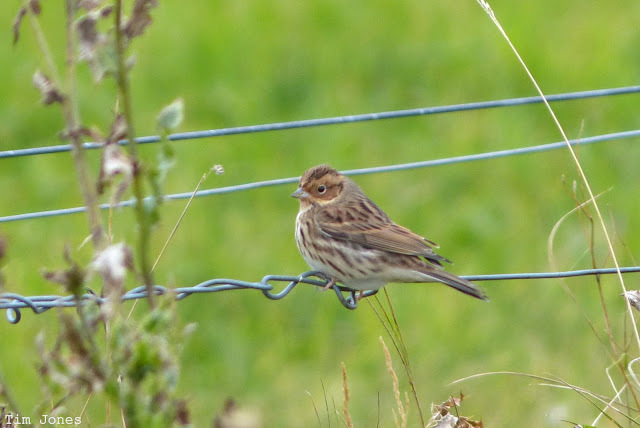 There were still lots of birds around and new scarcities included another Little Bunting and a Barred Warbler. Song Thrushes numbered 200, with 20 Redwings and the Mistle Thrush also seen. A good selection of warblers comprised 28 Goldcrests, 3 Yellow-browed Warblers, 3 Chiffchaffs, 4 Willow Warblers, 10 Blackcaps, 2 Garden Warblers and 5 Lesser Whitethroats; other small migrants included 13 Tree Pipits, 9 Dunnocks, 1 Robin, 8 Redstarts, 4 Spotted Flycatchers, 1 Pied Flycatcher, 1 Chaffinch, 41 Bramblings, 2 Siskins and a North-Western Redpoll. The 2 American Golden Plovers and the Little Stint were still present and 14 Sooty Shearwaters flew past at sea. A fall of migrants concentrated mainly around the south-west of the island, with various autumnal species arriving in larger numbers. Song Thrushes reached at least 125 birds, Goldcrests increased to 26 and 30 Bramblings were counted. The day's rarer birds were a Little Bunting, the 2 long-staying American Golden Plovers, the Buff-breasted Sandpiper and the Great Spotted Woodpecker. New species for the autumn were a Woodpigeon, a Mistle Thrush, 5 Chiffchaffs and 3 Chaffinches. Counts of other migrants included 12 Tree Pipits, 1 Black Redstart, 6 Redstarts, 2 Whinchats, 1 Ring Ouzel, 16 Redwings, 2 Lesser Whitethroats, 2 Garden Warblers, 2 Blackcaps, 3 Yellow-browed Warblers, 7 Willow Warblers and 2 each of Spotted Flycatcher and Pied Flycatcher. 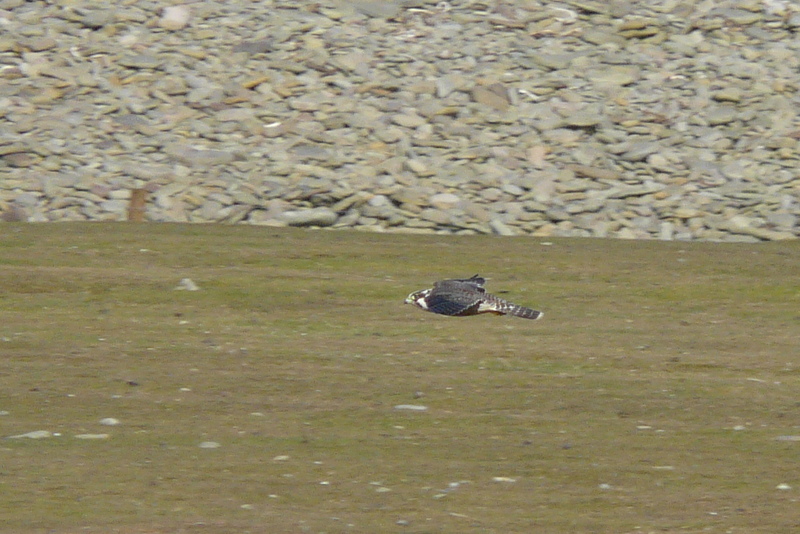 A Little Stint and 5 Jack Snipes were the best of the other waders and raptors included 2 Kestrels and a Hen Harrier. 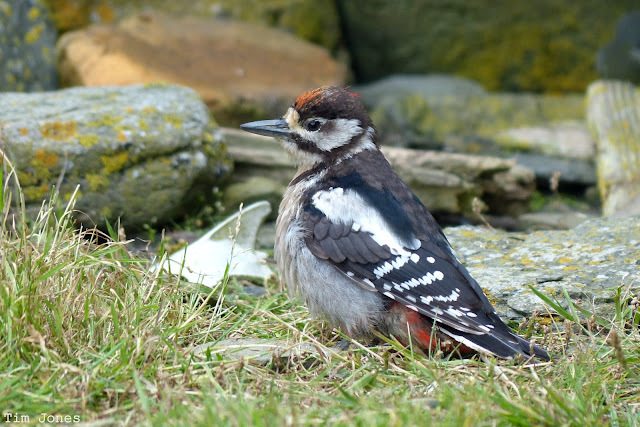 The Great Spotted Woodpecker was relocated in the sheep pund at Twingness where, in the absence of trees, it was foraging among the crevices in the dry stone walls. A long day in the field resulted in a good list of species and many birds dropping in during the afternoon. 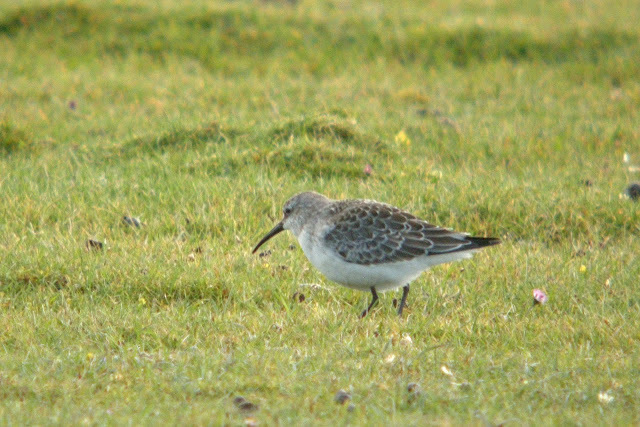 A long-awaited Buff-breasted Sandpiper was one such latecomer, flying in to land on the west coast after midday. Also new for the year, and the surprise of the day, was the first Great Spotted Woodpecker since 2003 flying south down the west coast. The Citrine Wagtail and an American Golden Plover were still around and Yellow-browed Warblers reached at least 11. The Yellow-broweds were the most numerous warblers once again, with 9 Willow Warblers, 3 Lesser Whitethroats, 1 Garden Warbler and 5 Goldcrests also recorded. Other small migrants included a Yellow Wagtail (probably a Grey-headed thunbergi bird), 2 Tree Pipits, 1 Black Redstart, 5 Common Redstarts, 1 Whinchat, 2 Robins, 1 Dunnock, 4 Ring Ouzels, 20 Song Thrushes, 6 Redwings, 3 Spotted Flycatchers, 2 Pied Flycatchers, 14 Lapland Buntings and the first Brambling of the autumn. 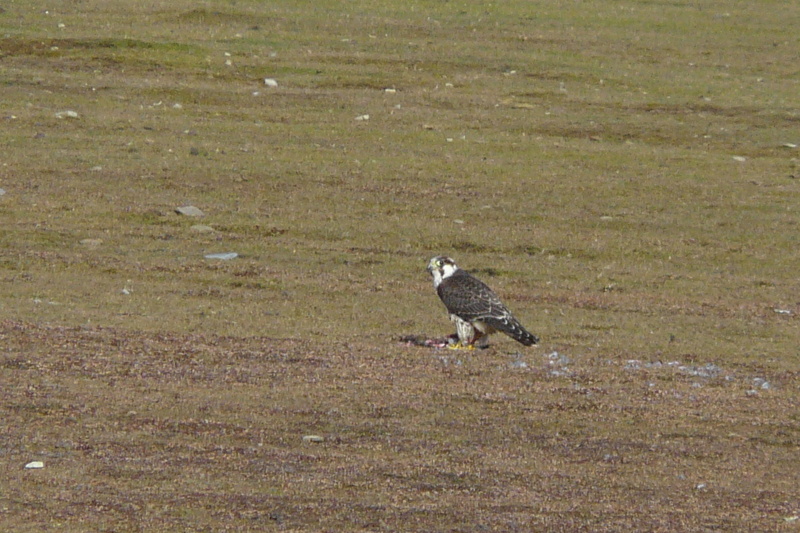 A couple of Hen Harriers, 3 Merlins and a Kestrel were the only raptors. Most of the previous day's migrants cleared out overnight, making way for a small number of scarcities. A Little Bunting near Kirbist was the first for a couple of years, but it soon vanished and couldn't be found again in the afternoon. Later in the day, an interesting wagtail was found at Lenswick: it appears to be a Citrine Wagtail, but does have some minor incongruities that raise questions of eastern flava wagtails or even hybrids. A Turtle Dove near the lighthouse was a new species for the year, the Wryneck was still at Holland House and the day's Yellow-browed Warbler count reached 10 birds. Counts of passerines included 2 Lesser Whitethroats, 1 Blackcap, 4 Willow Warblers, 1 Goldcrest, 1 Spotted Flycatcher, the Greenfinch, 1 North-Western Redpoll, 20 Lapland Buntings, 1 Song Thrush and 1 Redwing. The Hen Harrier and an American Golden Plover were still present and a Jack Snipe was seen. In perfectly calm conditions, a fair number and variety of small migrants meant that September had arrived at last. Scarcities were conspicuously few, but the highlights were a Wryneck and 5 Yellow-browed Warblers. Counts of common migrants came to 10 Lesser Whitethroats, 5 Garden Warblers, 2 Blackcaps, 1 Reed Warbler, 23 Willow Warblers, 6 Pied Flycatchers, 1 Spotted Flycatcher, 4 Whinchats, 116 Wheatears, 2 Song Thrushes, 1 Redwing, 1 Sand Martin and 1 Greenfinch. 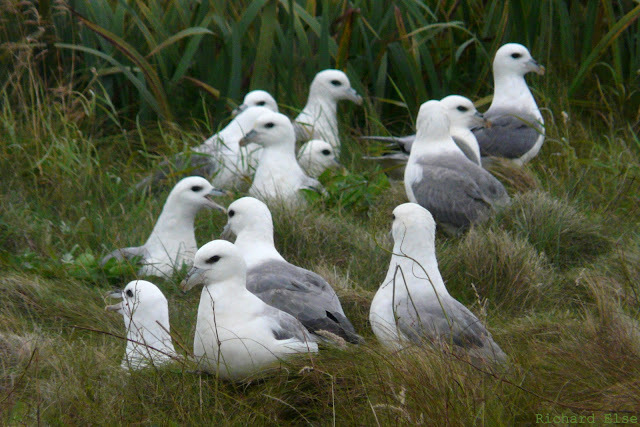 Other sightings included 4 Whooper Swans, 6 Grey Herons, a Hen Harrier and 2 blue phase Fulmars. The Goosander and the moulting adult American Golden Plover were both still present. A handful of notable migrants were found in the afternoon after a calm day perhaps gave them more chance to arrive. The first Yellow-browed Warbler of the year was the highlight, caught and ringed at the observatory at dusk, while a Lesser Whitethroat, a Tree Pipit and 4 North-Western Redpolls were also seen. 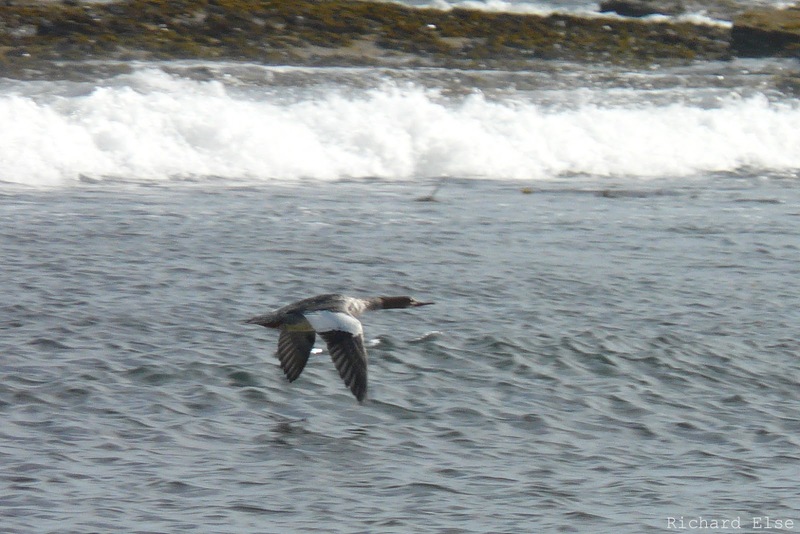 The Goosander was still present in Linklet Bay and sea passage included 25 Sooty Shearwaters, 14 Manx Shearwaters and a Storm Petrel. A clear influx of Snow Buntings involved at least 85 birds. 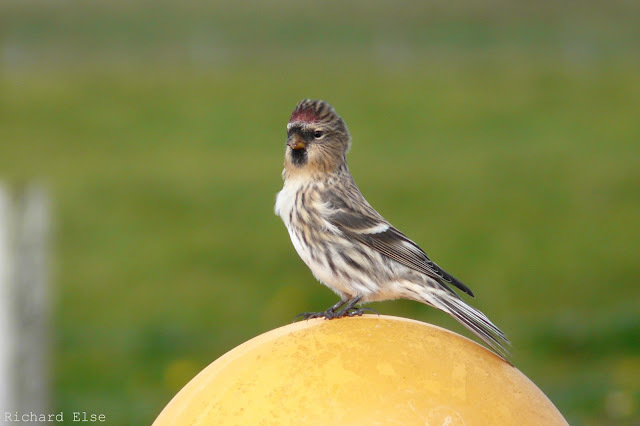 The recent redpolls have all been of a 'North-Western' appearance, perhaps birds of Icelandic origin. The Peregrine continued to show well around the north of the island. 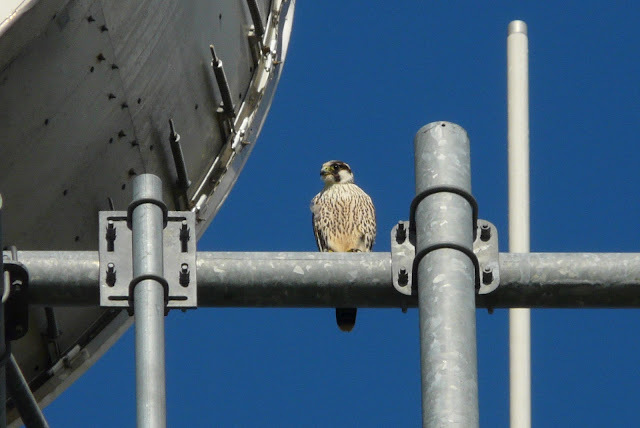 The following photos show the head pattern and underparts, both of which look promising as features of a possible Tundra Peregrine. Notable species remaining from earlier days included the 2 long-staying American Golden Plovers, the Goosander and the Black Redstart. A couple of North-Western Redpolls, 18 Lapland Buntings and an increase to 49 Snow Buntings were the only other sightings worth mentioning. 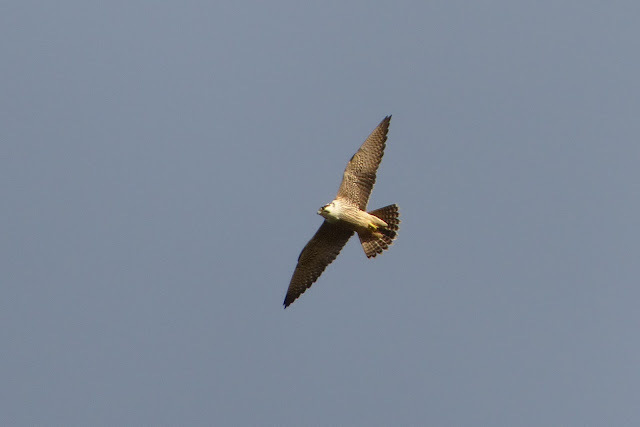 This juvenile Peregrine has been present for three days now, and possibly shows some characteristics of the Nearctic form Tundrius. We are looking into this possibility and hope to get more pictures soon. There was very little change once again, with long-stayers continuing to provide most of the highlights. Both American Golden Plovers and the Barred Warbler were still around, and a Pectoral Sandpiper was seen at Nether Linnay. A Short-eared Owl and another North-Western Redpoll were the best of the new birds. The first Curlew Sandpiper of the autumn was among a small number of new birds on another breezy day. Other waders included both American Golden Plovers, a Little Stint and a Jack Snipe. A Barred Warbler at Westness was probably a fresh migrant, while a Tree Pipit was the first of its kind for a few weeks. 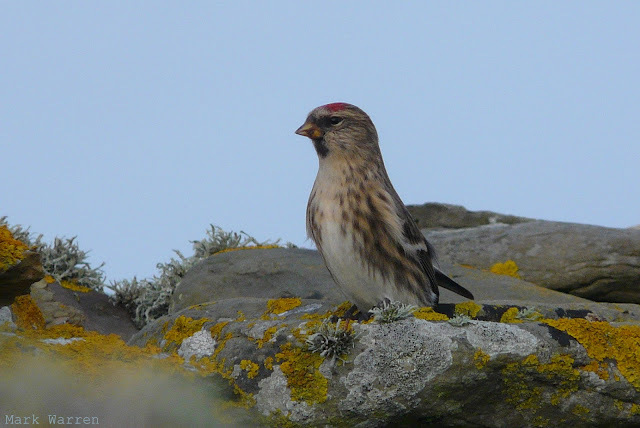 A North-Western Redpoll and 20 Lapland Buntings were also seen. A slightly more eventful day began with both long-staying American Golden Plovers being seen together near the observatory. A protracted period of year-list stagnation was finally ended by a Goosander, a very uncommon duck here, flying in to Gretchen Loch and later reappearing on the sea near the old beacon. The highlight of the day, though, waited until the afternoon, when an unprecedented group of 4 Pectoral Sandpipers arrived on the golf course. The Barred Warbler, Black Redstart and Garden Warbler were all still present, while other passerines included 7 Rock Pipits, 248 Meadow Pipits, 120 Wheatears, 2 Willow Warblers, 2 Redpolls, 11 Lapland Buntings and 17 Snow Buntings. A few geese were on the move again, with 67 Pink-footed Geese and 52 Greylag Geese recorded. As winds dropped slightly and rain confined itself to occasional showers, it was nice to see a few new migrants appearing. Wheatears certainly seemed to have arrived in numbers, with 123 counted around the island. A Barred Warbler and a North-Western Redpoll were both at Gravity, the first Black Redstart for about a month was at nearby Antebreck and the Holland House garden contained a Garden Warbler and 2 Willow Warblers. A count of 17 Snow Buntings indicated a small influx and 5 Lapland Buntings were seen. 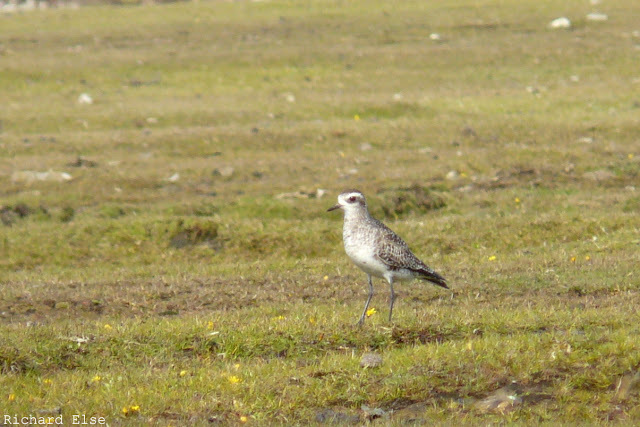 The moulting adult American Golden Plover was seen throughout the day, and was even visible through the observatory windows during the evening meal. There was still little change in overall numbers of birds, but at least a couple of new migrants did arrive on another windy day. A North-Western Redpoll was almost expected given the prevailing wind direction; a Reed Warbler was less so. A Robin and a Willow Warbler were at Holland House, and a count of 65 Wheatears seemed to include a fresh batch of migrants near the lighthouse. A Little Stint was still on the west coast and an American Golden Plover (the other one this time) was nearby. The winds persisted, but brighter conditions made bird census slightly easier. Not that there was much evidence of migration - it's quite a poor September day when not a single warbler is seen here. 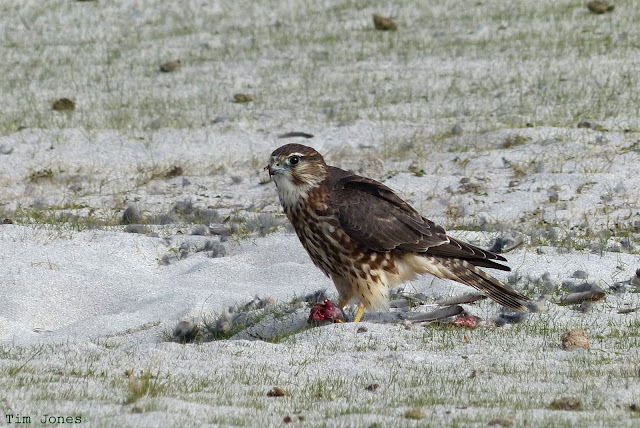 The only noteworthy passerines were 5 Rock Pipits, 10 Lapland Buntings and 4 Snow Buntings; the best new non-passerines were a Peregrine and a Merlin. Sea passage showed little change, with 4 Sooty Shearwaters and 2 Manx Shearwaters passing the hide in 2 hours. Around 1,500 Golden Plovers were counted, and an American Golden Plover was still among them. Strong winds with rain for most of the day were mostly responsible for a very scanty list of sightings. Both American Golden Plovers and 2 of the Little Stints were still in residence, 9 Lapland Buntings were seen and 2 Willow Warblers were at Holland House. After dark, the rough weather prompted the autumn's first major effort at nocturnal wader ringing. A total of 39 birds were caught (by 'dazzling' with a torch and hand net), including a Little Stint, a Pink-footed Goose and an Arctic Tern among the more usual species. A Black-tailed Godwit trapped in the middle of the night was only the second of its kind ever to be ringed here. With daylight came just about nothing new to report, but a good quality selection remained from earlier days: both American Golden Plovers were still around, along with a Pectoral Sandpiper and the 3 Little Stints; a Willow Warbler was the only warbler of any kind; and 4 Lapland Buntings and a Snow Bunting were seen. Sadly, anticipative morning census rounds found no trace of the previous day's transient Tringa, that particular yellow-legged cherry having clearly departed without any offer of a second identifying bite. C'est la vie. 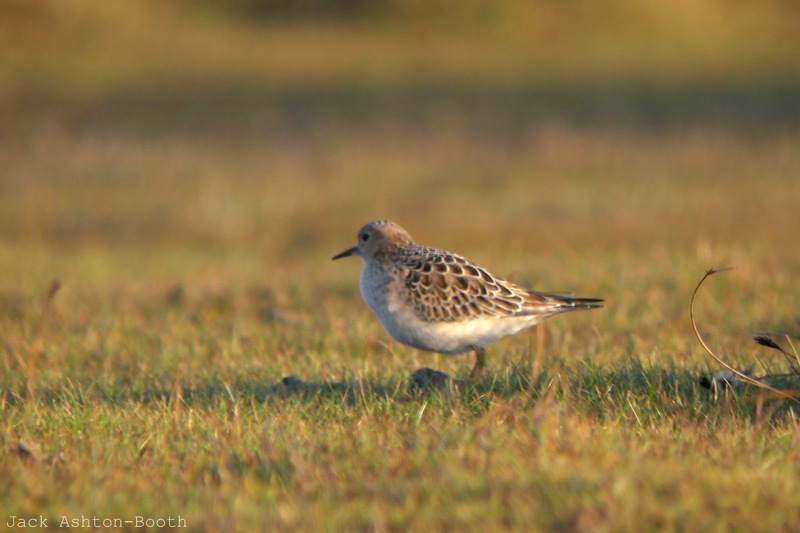 But, on the bright side, a growing collection of its compatriots was still around: both American Golden Plovers remained, bird 1 mingling with the hundreds of plovers by the main road, bird 2 preferring the comparative solitude of the west coast; and Pectoral Sandpipers, too, achieved plurality with a new bird appearing at Hooking in addition to the lingering individual on Gretchen Loch. With shorebird stars and stripes arriving in such profusion, it was hard not to feel just slightly cheated when 3 tiny waders on the west coast turned out to be all 'just' Little Stints. The recent dearth of passerine migrants was alleviated very slightly by a Whinchat, 2 Garden Warblers and a Willow Warbler, while 5 Lapland Buntings, 2 Snow Buntings, 77 Wheatears and 284 Meadow Pipits were also counted around the island. Pink-footed Goose passage came to 185 birds, mostly passing south during the morning. 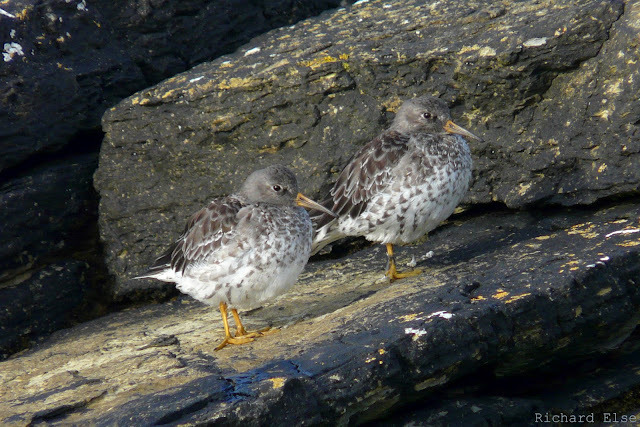 Purple Sandpipers have been quietly passing through recently, with counts in excess of 70 birds on some days. The trio of vagrant waders consisting of 2 American Golden Plovers and a Pectoral Sandpiper continued to be seen all day. Unfortunately, the best bird of the day was not so obliging: a Yellowlegs sp. was seen circling over Gretchen Loch but, frustratingly, chose not to land and flew away high before it could be positively identified. 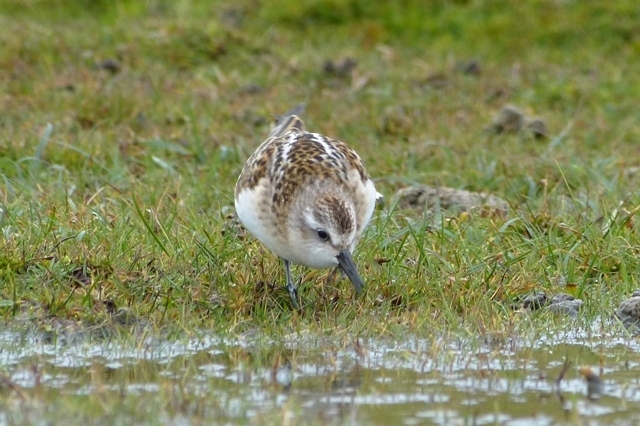 The autumn's first Little Stint was the only other notable wader, although Golden Plovers reached a new peak count of 1,110 birds. Ducks, too, were on the increase and included at least 134 Teal and 18 Pintails. 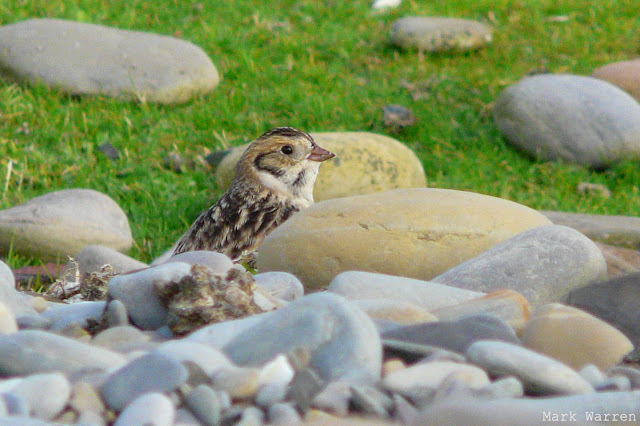 A Sand Martin, a Willow Warbler and 3 Rock Pipits were all new migrants, the latter species having been inexplicably absent as a breeding species this year, and Lapland Buntings increased to 14. A temporary drop in the incessantly westerly winds made birding a bit easier and a couple more transatlantic waders appeared. Our third Pectoral Sandpiper of the year, a juvenile bird, was found at Kirbist in the afternoon. Then, while the lingering adult American Golden Plover gave excellent views right by the main road, another one - a much paler winter-plumaged bird this time - was discovered on the west coast. The new bird brings NRBO's all-time total of American Golden Plovers to 12, no fewer than 3 of which have been this year. A plurality of pluvialids: The upper bird has been present from 5th September; the lower one was new today. This is the first time that more than one American Golden Plover has been present here at the same time and, with the unseasonal bird in the spring, the first time that three have been recorded in the same year. The calmer weather allowed a few more passerines to arrive, and counts included 292 Meadow Pipits, 59 Wheatears, 1 House Martin, 1 Garden Warbler, 3 Crossbills, 7 Lapland Buntings and the autumn's first Snow Bunting. 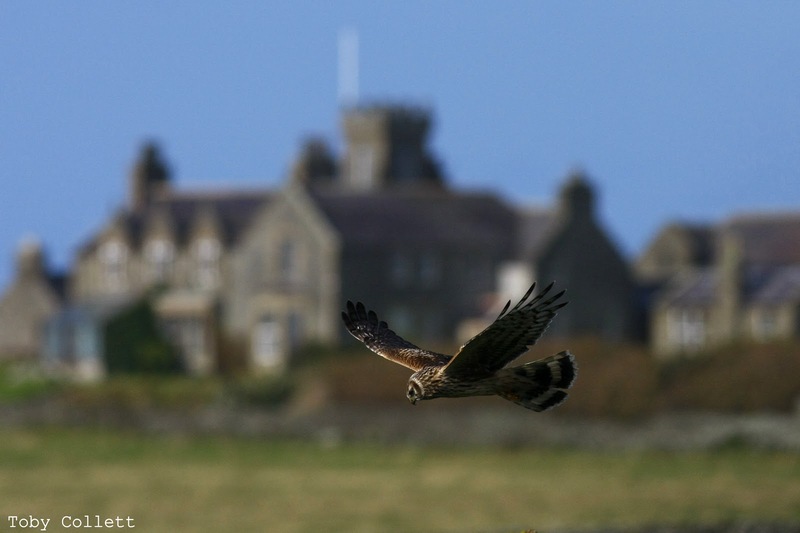 A Kestrel, 2 Merlins and 2 Peregrines were seen, 10 Pink-footed Geese remained from the previous day's movement and 29 Sooty Shearwaters were recorded in 2 hours of seawatching. A few more Pink-footed Geese were on the move, several flocks totalling 211 birds passing south throughout the day. Other new migrants were thin on the ground and amounted to little more than 4 Lapland Buntings and 4 Red-breasted Mergansers. 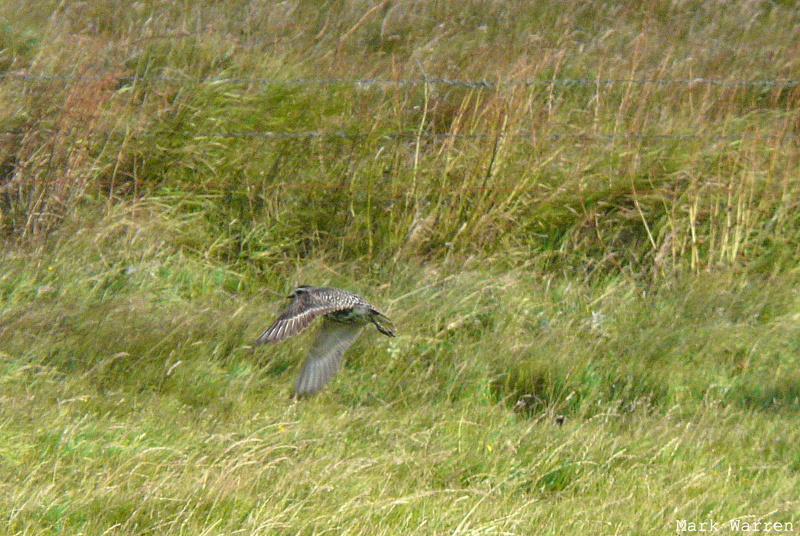 The American Golden Plover was still present and a Barred Warbler was also a presumed long-stayer. 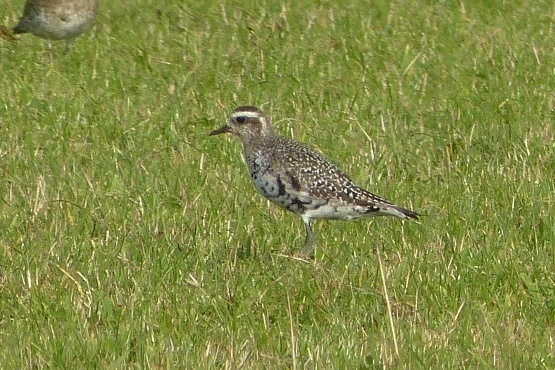 The American Golden Plover was seen throughout the day, although it could be difficult to find among the mobile throngs - totalling around 800 birds - of Golden Plovers that were repeatedly split and scattered around the island by passing bonxies and farm machinery. The autumn's first Red-breasted Merganser and 4 Pink-footed Geese arrived, a Grey Plover was the first for a few weeks and a Lapland Bunting was in the north of the island. Sea passage remained similar to recent days, with 3 Sooty Shearwaters and 2 Manx Shearwaters the only noteworthy species. The adult American Golden Plover was still present (not a juvenile as we initially reported yesterday), in the company of over 500 Golden Plovers near Peckhole late in the afternoon. Otherwise there still wasn't a lot of change among the island's other birds, with 2 Willow Warblers the only likely new migrants. With the prevailing wind direction still set very firmly in the west, rarity hopes were mainly pinned on the possibility of a storm-blown Nearctic wader choosing North Ronaldsay for its Palearctic landfall. Such expectations were soon realised with an adult American Golden Plover joining the flock of its European relations near the observatory for the afternoon. This is the eleventh record of the species here, and the second of 2012. There wasn't a lot of change among the island's other birds. A Barred Warbler and 2 Lapland Buntings were seen again, while a Goldcrest was just about the only new passerine. 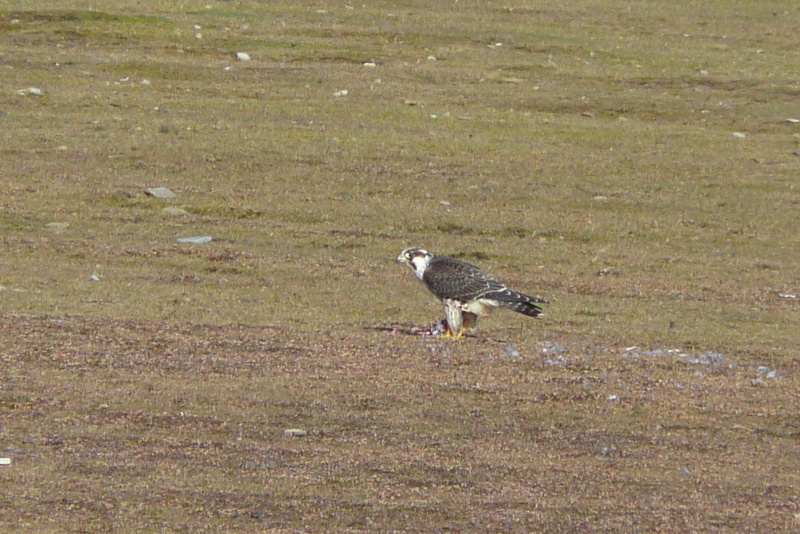 A couple apiece of Merlin and Peregrine were present and 4 Grey Herons were seen. The westerlies picked up to howling speeds for a day of violent gales and very difficult birding. Decent numbers of waders were seen in the few spots that were sheltered enough to hold binoculars steady, including 9 Ruffs and 5 Black-tailed Godwits. Easily the highlight, though, and typical of such rough conditions, was the year's first Grey Phalarope found on Hooking Loch in the afternoon. 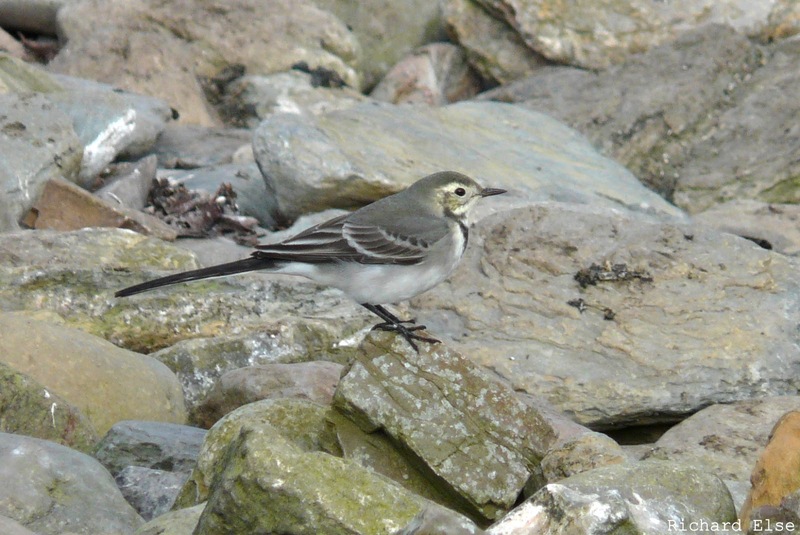 Alba wagtails of various descriptions have been passing though in increased numbers recently. Persistent westerlies continuing, there were at least a handful of small migrants in the north of the island. A couple of Lapland Buntings were perhaps to be expected on winds of this direction, while a Whitethroat, a Garden Warbler and Willow Warbler also managed to make landfall. The Meadow Pipit count crept up to 243 and at least one of the Barred Warblers was still present. A two-hour stint in the seawatching hide produced 11 Sooty Shearwaters, 4 Manx Shearwaters and 1,091 Fulmars. After another day of westerlies there was little new to report from land or sea. The best of the small migrants were 7 White Wagtails, a Garden Warbler, 2 Willow Warblers and 3 long-staying Barred Warblers. An inauspicious start to perhaps the most eagerly anticipated month in the Northern Isles birding calendar had few migrant passerines besides a Garden Warbler and a lingering Barred Warbler. Seawatchers saw 18 each of Sooty Shearwater and Manx Shearwater, 7 Storm Petrels and 1,855 Fulmars from the hide, and a notable movement of 58 Great Skuas was recorded. Mass strandings of Fulmars occasionally occur at this time of year, usually during periods of calm weather. Birds come to ground inside the island's perimeter wall and, with deep grass impeding their run-up and insufficient wind to take off, find themselves unable to get out again. Passing Fulmars come to investigate and end up getting stranded themselves, usually until the observatory staff arrive to gather them up, ring them and release them back out to sea. The largest stranding of the year took place today, and 170 birds (interestingly, all adults) were ringed in a single field at Bridesness during a very wet and smelly afternoon. The first Lapland Bunting of the autumn was seen outside the observatory in the morning. A Collared Dove was new, and other landbirds included 2 Merlins, a Peregrine, a Garden Warbler, 2 Willow Warblers and a couple of Barred Warblers (at least one of which was a long-stayer). Seawatching sightings were fairly typical for the time of year, and included 13 Sooty Shearwaters, 4 Manx Shearwaters and a Storm Petrel.